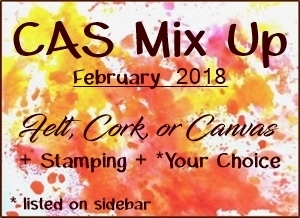 Today, playing in the February CAS Mix Up card challenge. Our inspiration is to use Felt, Cork or Canvas plus stamping plus a choice. My card includes cork, water color, die-cut, dry embossing, stamping. I die-cut the detailed butterfly from cork. The water color panel beneath was cut using a solid butterfly die. The butterfly is mounted on a "quilted" round panel. The quilting was achieved by using a striped cutting plate to dry emboss ... ran it through Big Shot twice ... the second time at a 90 degree angle. A few gray-toned gems and sentiment complete the card. So pretty and very CAS. Loving the softness of your card! The cork is a perfect contrast with the pretty watercolor background for your butterfly! Love that quilted circle you so brilliantly embossed! Thanks, Marilyn for sharing this with us at CAS Mix Up! Beautiful watercolouring and great cork die cut on the butterfly! Great extra texture from the circle and the trail of gemstones. Thanks for joining us at CAS Mix Up!